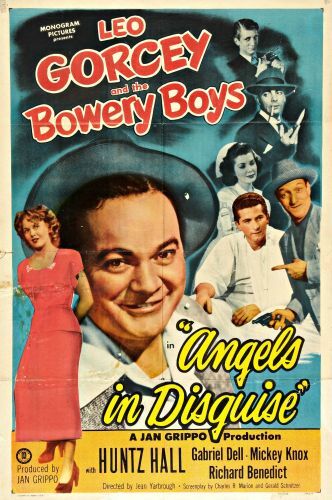 The 15th film in the Bowery Boys series, Angels in Disguise combines lowbrow humor with "film noir" melodramatics. 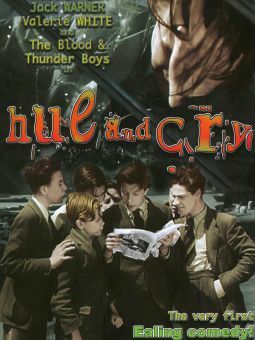 Bowery boys Slip (Leo Gorcey) and Sach (Huntz Hall) are copy boys for a crusading newspaper, whose publisher (Ray Walker) is trying to crush the notorious "Loop Gang". When the boys' policeman pal Gabe (Gabriel Dell) is wounded in a shoot-out with the Loop mob, Slip and Sach take it upon themselves to expose the gang. All the Bowery boys (including sweet-shop proprietor Louie) disguise themselves as gangsters and infiltrate the Loop Gang, which is run by a young, erudite intellectual (Mickey Ryan). The scheme to destroy the Loop mob from the inside is flummoxed by the crusading newspaper's cartoonist, actually a member of the crooked gang who has been sending out coded tips in his comic strip. The Loop Gang gives the Bowery Boys a real "going over", but the cops arrive in time to round up the crooks.